Beautiful certificate from the Charlottesville and University Gas Light Company issued on April 4, 1861 (issued 8 days before the beginning of the U.S. Civil War). This historic document has an ornate border around it with the company name on top center. This item has the signatures of the Company's President, J. S. Davis and Treasurer and is over 147 years old. The certificate was issued to G. A. Perdicaris and endorsed by him on the verso. 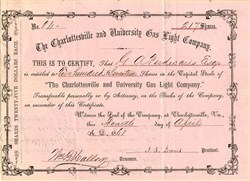 The Charlottesville and University Gas Light Company serviced the city of Charlottesville and the University of Virginia. Charlottesville is an independent city located within the confines of Albemarle County in the Commonwealth of Virginia, United States, and named after Sophia Charlotte of Mecklenburg-Strelitz, the queen consort of King George III of the United Kingdom. Charlottesville is best known as the home to three US Presidents, Jefferson, Madison and Monroe, as well as the home of the University of Virginia, founded by Thomas Jefferson. The city is also known for Jefferson's Monticello, his renowned mountain-top home which attracts approximately half a million tourists every year.